It's easy to forget with the election of our incoming president-elect that millions of people mobilized to fight for their rights long before Donald Trump announced his candidacy. 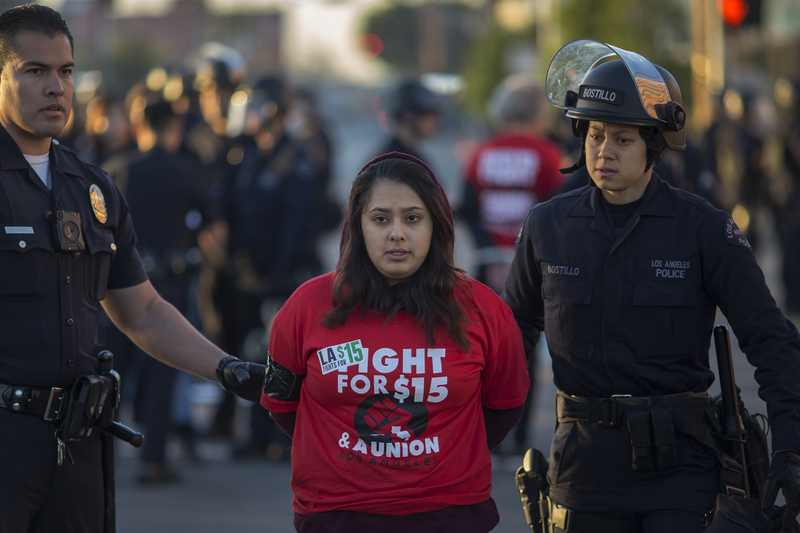 One such movement is the Fight for $15 campaign comprised of a labor union-backed group of organizations fighting for a national $15 minimum wage. On Nov. 29, service industry workers and their allies took to the streets from coast to coast to demand a living wage, and these photos of Fight For $15 protests show why this movement isn't going anywhere, even under a Trump administration. Arguably more organized than the Occupy Wall Street movement, Fight for $15 activists planned and executed the National Day of Disruption, a series of protests around the country designed to make their voices heard. At the heart of these protests lies the desire for a working class unity that hasn't been seen for quite some time. This unity would be predicated on the opinion that "white working class Trump voter" is a dangerous myth and that economic inequality affects all working class and poor Americans — both Democrat and Republican. Reverend William Barber II, known in North Carolina as the president of the state chapter of the NAACP and a leader in the state's multi-faith "Moral Monday" movement, was arrested along with 22 other protesters in Durham, NC. With protests planned in 340 American cities, the National Day of Disruption certainly disrupted the post-Thanksgiving consumer narrative, and hopefully sent an important message to the incoming administration: that the fight for $15 isn't going anywhere.